A laceration (cut) may only go through skin, or it may cut through blood vessels, nerves, and tendons that lie just under the skin. An avulsion occurs when part of the skin or soft tissue is torn off. With an amputation, tissue is completely cut or torn away from the finger. 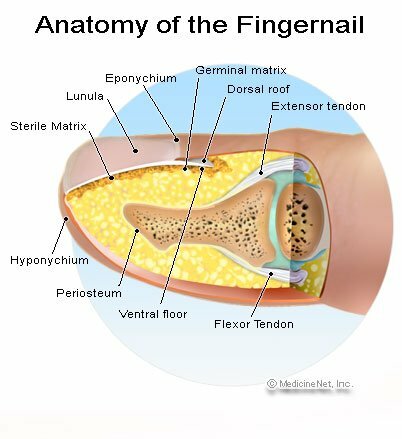 The fingernail and the underlying nail bed are the most commonly injured part of the hand. If a fingernail is injured by a direct blow, the underlying bone may also be broken. Each finger (except the thumb) has three bones, or phalanges: the proximal (closest) phalanx (plural-phalanges), the middle phalanx, and the distal (furthest) phalanx. A fracture of a phalanx may be an isolated injury, but it is often associated with injury to tendons, ligaments, fingernails, or other soft tissue. A dislocation is an injury to a joint that causes a bone to move out of its normal alignment with another bone. Finger dislocations commonly happen as a result of a direct blow to the finger (like while playing ball sports). Usually a dislocation causes damage to the surrounding ligaments (ligaments hold bone to bone), which are stretched and remain damaged even after the dislocation is reduced (put back in place). Ligaments are the tough tissues that hold two bones together and stabilize a joint. A ligament may be torn by a forceful stretch or blow, leaving the joint unstable and prone to further injury. Tendons are the fibrous bands that attach muscles to bones and allow the flexible, precise movements of the joints. Tendons lie just under the skin in the fingers and are covered by a protective sheath. 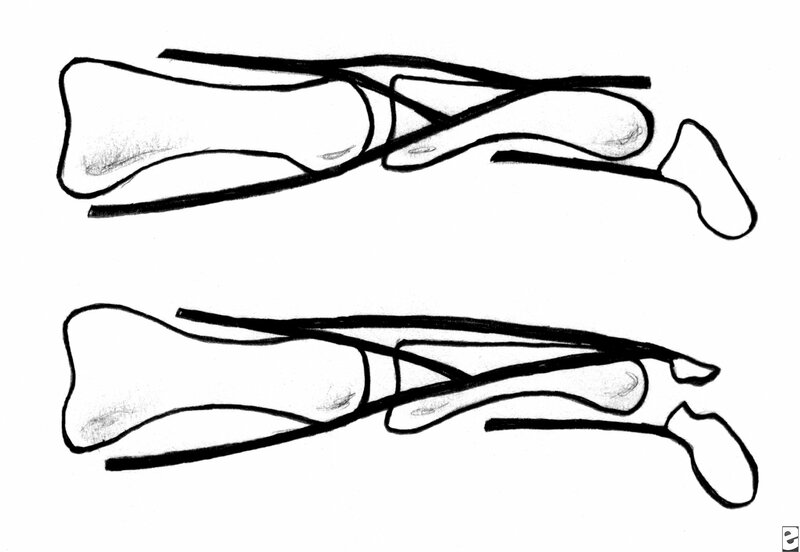 Both the tendon and its sheath can be damaged by a laceration (cut) or a crush injury. A tendon can also be torn away from its bony attachment, which is called an avulsion fracture. 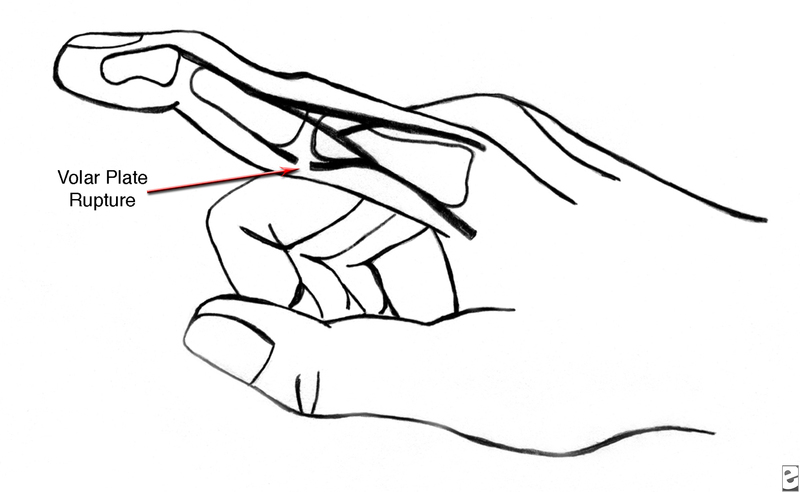 Sensation to the finger is supplied by four nerves, two (dorsal and volar digital nerves) running along each side of the finger. Damaging the nerve can cause numbness on the side of the finger supplied by the nerve. A finger may be injured by a direct blow or cut. Many injuries are work-related. The finger may also be jammed, twisted, or stretched playing sports. Animal bites are another common cause of finger injuries. A direct blow to the tip of a finger can cause tendon or ligament damage, as well as fracture or dislocation of the bones. If the side ligaments are torn, the patient may have pain on the side of a joint, and the joint may be loose. 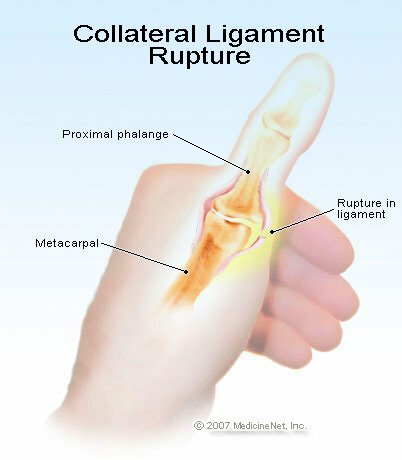 If the ligament on the bottom of the joint (called the volar plate) is torn, the patient may have pain and looseness on the underside of the finger. 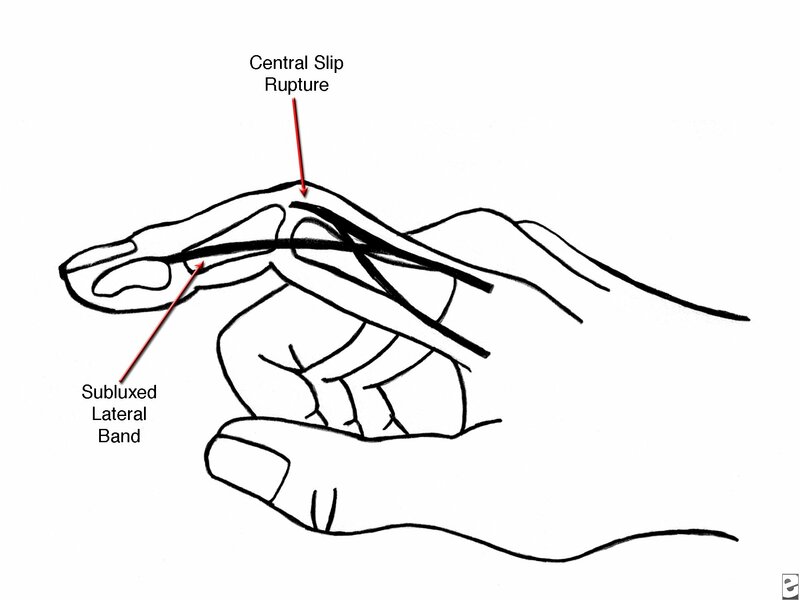 If a tendon is torn away from its attachment, the patient may be unable to completely bend, straighten, or grip with the finger (or thumb). Skier's (gamekeeper's) thumb: Torn ulnar collateral ligament (the ligament between your thumb and palm in the web space of the thumb and hand), often caused when a skier falls on his or her pole with an open hand. Mallet (or drop or hammer) finger: Extensor tendon (the tendon that is on the back or "dorsum" of your finger responsible for extending the finger straight) torn away from the distal phalanx (bone in the end of your finger). This causes the tip of your finger to sag and not completely straighten out. 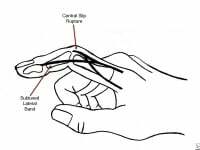 Boutonniere deformity: The stabilizing portion of the extensor tendon (the tendon that is over the backside of your finger) is torn between the proximal and middle phalanges (the closest and middle bones of your finger). This causes an inability to straighten the joint between the proximal and middle phalanges. Swan neck deformity: Volar ligament (ligament on the palm side of your finger responsible for flexing your finger) torn between the proximal and middle phalanges. As this injury heals, the ligament gets lax and the finger bends in a characteristic "swan neck" pattern. The nail bed, which is the supportive tissue underneath the nail, can be damaged by a cut or blow. Sometimes this leads to a collection of blood under the nail, called a subungual hematoma. 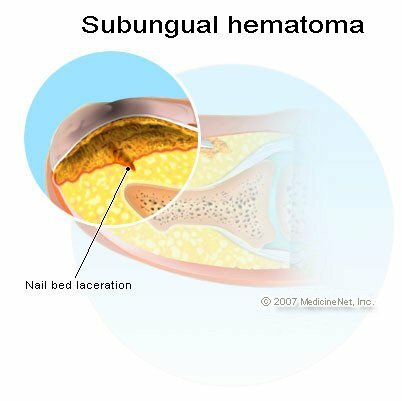 Subungual hematomas can be very painful and sometimes need to be drained. If the nail is severely damaged, it may need to be removed. Animal bites can cause tissue damage and also can lead to serious infections if not treated properly. A human bite would is often more serious than an animal bite would. It usually happens from punching someone in the mouth with a closed fist (called a "fight bite"). These wounds require thorough cleaning and often antibiotics. A paronychia is an infection in the area where your fingernail attaches to your finger. It often starts after minor trauma such as a hangnail or nail biting. Although bleeding, bruising, deformity, or swelling of an injured finger may be obvious, significant injuries may be present that are not obvious right away. Some symptoms, such as the redness, pus, and fever of an infection, will not develop for hours to days. The patient has heavy bleeding or bleeding that does not stop. There is obvious missing tissue or amputation. There is obvious deformity of the finger. A cut gapes open or goes deeper than the very top layer of skin. The patient is unable to completely clean out the dirt or foreign bodies from a wound. There is an area of numbness or weakness. The patient is unable to use the finger normally. The patient develops redness, drainage, pus, swelling, fever, or other signs of infection. The doctor will want to examine the patient's hand, including testing strength, sensation, and range of motion of the injured area. If the doctor suspects a fracture, or a foreign body such as glass or metal in the wound, X-rays may be ordered. X-rays do not show all types of foreign bodies, nor do they show injuries to tendons or ligaments (such as sprains and strains). Treatment for finger injuries depend on the type of injury. Some finger injuries can be treated at home (for example, buddy taping a broken finger). Other more serious injuries to fingers (fractures, dislocations, deep cuts or wounds) will need medical treatment. Control bleeding by direct, continuous pressure for at least several minutes. Elevate the hand above the level of the heart to help slow the bleeding. Find torn or missing tissue and save it, if possible. Gently rinse the tissue off with water if it is very dirty, and place it in a sealed plastic bag. Place the bag in ice water and bring it to the hospital with the patient. Cover the wound with a clean, dry bandage. Remove loose dirt or foreign bodies. Do not try to remove objects that are deeply or firmly embedded. Run the patient's hand under tap water for several minutes, scrubbing gently with a washcloth if needed to remove dirt. Dry and then apply an antibacterial ointment. If the finger is obviously deformed, immobilize it with a splint in whatever position is least painful. Almost any small rigid item such as a popsicle stick, a pen, or a piece of cardboard can be tied or taped to the finger as a splint. A finger can also be buddy-taped-that is, taped to the finger next to it. Tape securely, but not tightly. If the fingers are taped too tightly it can cause additional swelling and may cut off circulation to the injured finger. Before treating the injury, the doctor may numb the tissue with a local anesthetic such as lidocaine. This is usually done by injecting an anesthetic near the base of the finger, called a "digital block". A digital block is done with a small amount of lidocaine placed on either side of the base of the finger where the main branch of the nerve is located. This provides anesthesia (numbing) to the entire finger with a minimum amount of needle shots and pain. The patient may also be given pain medications by mouth or through an IV. If the patient has an open wound such as a laceration or an avulsion, the doctor may want to explore the wound more carefully to assess the damage or to remove foreign bodies. The wound will then be thoroughly washed. The nail bed, tendons, or other deep structures are sometimes sutured (stitches sewn to close the wound) with absorbable (dissolving) thread. Thread used to close the skin usually does not absorb, and stitches will need to be removed in one to two weeks. Some wounds are temporarily closed with loose stitches until the patient can be seen by a hand surgery specialist in a day or two. The separated tissue may be able to be reattached to the finger. A piece of tissue that is very small, is severely damaged, or has been separated for a long period may not be salvageable. Reattachment of amputations closer to the base of the finger (more proximal), especially ones that include the middle part or base of the finger, are more likely to be attempted by the hand surgeon. Skin grafting is used in some cases where a large piece of skin is missing. A large (>50% of nail surface) or very painful patch of blood can be drained from under the nail by "trephination." Trephination is done by boring a few holes in the nail to relieve the pressure and drain the blood. This can be done with a red-hot cautery device (a heated metal probe), a needle twisted through the nail, or a small drill device. This infection of the lateral nail fold is drained by putting a small incision in the skin overlying the infected area. It is then cleaned, and antibiotics are placed on it. Depending on the severity of the infection, the patient may need oral antibiotics. Reduction (realignment) of broken or dislocated bones usually takes place in the emergency department under local anesthesia. After the bone is put back into place, the doctor may perform more X-rays to make sure the bones are realigned, then a splint is applied. Some fractures and dislocations require surgery to repair. Fractures, dislocations, tendon injuries, and some lacerations may be treated by splinting part of the finger or even the whole hand or wrist. This splinting allows the tissues to rest and therefore heal faster. Some wounds are at higher risk of infection than others and may be treated with antibiotics. If the doctor prescribes antibiotics, it is very important the patient take the medication as directed and finishes the whole prescription even if the patient feels fine. Certain fractures, tendon lacerations, amputations, and other injuries may be referred to a hand specialist for treatment or for follow-up. Follow the doctor's instructions for bandage changes. The doctor may want the patient to clean and dress the wound daily or may tell the patient to leave the bandages in place until they are rechecked in the office. Do not remove a splint unless instructed by the doctor. Certain injuries must be immobilized in a specific position in order to heal properly. Some splints are damaged by water and should not get wet. Ask the doctor whether water will damage the splint. If the patient is prescribed antibiotics, take the full course of medication even if there is no sign of infection. Follow-up is critical to monitor the progress of the patient's recovery. Keep follow-up appointments as directed, even if the patient feels fine. The doctor will tell the patient about when to rest the injured area, and when and what activity to start to prevent or reduce stiffness. Be careful of chain saws, snow blowers, paint and grease guns, and other high-powered equipment. Wear heavy leather gloves and do not wear rings or other jewelry when operating such equipment. Use and store kitchen knives carefully. Never reach blindly into a sink or drawer containing a knife. Be aware that many finger injuries occur during athletic events, especially ball games (such as, basketball, baseball, football). Remove rings or other jewelry before participating in sports. If you enjoy participating in such activities, keep some first aid items on hand for splinting a finger. The most common way you can be bitten on the hand is when trying to separate two fighting animals. Even your loyal dog can accidentally bite you during a fight. Do not approach or try to hand feed feral (animals). Prognosis depends on the type and severity of injury. For certain hand injuries, the follow-up and rehabilitation may be the most important factor in the ultimate outcome. The goal is for the patient to have full use of the finger with no stiffness or pain. Picture of Phalanges (bones) of the finger. The distal, or furthest, phalanx (the tip under the fingernail); the middle phalanx; and the proximal, or closest, phalanx. Anatomy of the tendons and ligaments of the finger. Skier's (gamekeeper's) thumb. The ulnar collateral ligament is torn, causing the joint to be loose. American Family Physician. 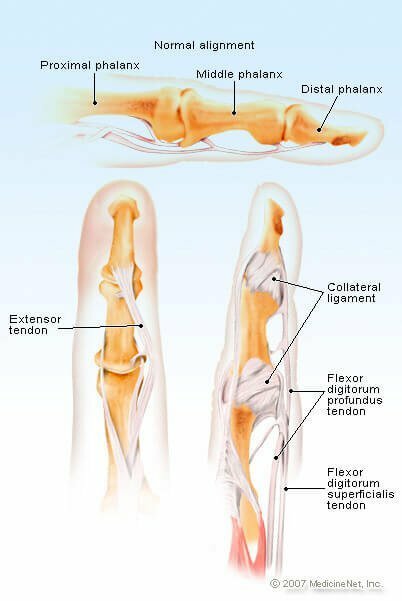 Acute Finger Injuries: Part I. Tendons and Ligaments. American Society for Surgery of the Hand. Fingertip Injuries. healthychildren.org. Common Finger Injuries in Athletes. What caused your finger injuries?